Ralph Maxwell of Alamo, Texas doubled the previous world record in the M90 decathlon with his winning score of 7,069 on the second day of competition at the 2011 WMA World Track & Field Field Championships. After day one, Maxwell’s score of 3,956 had already exceeded the world record of 3,190 points set by Austria’s Vic Younger in 2003. Maxwell, the solo competitor in his age group for the decathlon, opened up the first day with a 19.69 in the 100m, a long jump of 2.63m/8-7.5, a 6.17m/20-3 throw in the shot put, a clearance of 1.03m/3-4.5 in the high jump and a time of 1:49.24 in the 400m. On day two, Maxwell ran a 21.62 in the 80m hurdles, threw the discus 13.98m/45-10, vaulted 1.40m/4-7, had a javelin throw of 18.30m/60-0 and finished the event with an 11:30.51 in the 1,500m. Marietta, Ga. multi-event specialist Philippa Raschker earned her first gold medal of the 2011 WMA World Masters Championship with a win in the W60 heptathlon. She wrapped up day two with the top long jump mark (4.27m/14-0), a throw of 22.01m/72-2 in the javelin and a time of 3:08.45 in the 800m to finish with a final score of 5,694. Raschker’s winning score was 400 points ahead of her closest competitor despite difficulties with an achilles injury. As of right now, Raschker still plans on competing in the nine other events she is entered in. “I’m going to be careful, and no matter what, you take one event at a time,” she said. Although she is a seasoned veteran on the World Masters scene with 69 gold medals under her belt in the last 28 years, Raschker doesn’t take her victory for granted. In his first ever WMA World Masters competition, Daniel King of Boulder, Colo. led a US sweep of the top three places in the M50 8k cross country race. King crossed the line in 27:48.8, just ahead of US teammates David Cannon and Brian Pilcher. King is no stranger to success, having finished second in his age group at the US Masters Cross Country Championship in February, but the win was still a surprise. 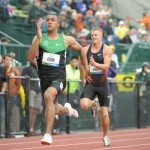 For King, a former runner at the University of Colorado, just competing at the meet is an honor. 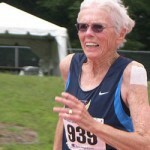 Elena Shemyakina and Kathryn Martin ran to victories in the 8k cross country events on the first day of the World Masters Association Track & Field Championship. Shemyakina of Geneva, Ill. and Joannie Siegler of Davis, Calif. finished one-two in the W50 8k run to lead the United States to victory in their age group. Shemyakina’s time of 31:36.1 led the field by a 45-second margin, with Sigler finishing in 32:19.9. Martin’s winning performance in the W55 8k run was the key to a US victory for the age division. Martin, a native of Northport, N.Y., crossed the line in 32:52.5 to lead the United States over Australia by one minute in the team totals.